I just co-hosted a Star Wars baby shower for my brother and sister-in-law this weekend, so I figured it was the perfect time to share these adorable onesie costumes for babies. My sister-in-law is due about a week after Halloween, so no baby costume this year unless he makes an early appearance! That means a full year of plotting and planning for next Halloween! Babies wear adorable onesies all year long, so how do you up the game at Halloween? Turn one of those onesies into a costume with a few simple or elaborate additions. My sweet pencil onesie costume was accomplished by adding simple duct tape to a yellow onesie and a pink knit cap. Simple and adorable, perfect for a teacher’s baby! This baby Waldo onesie costume is super fun. It’s also perfect for a teacher or anyone that loves to read! If DIY isn’t your thing, it’s pretty easy to buy a cute Halloween Onesie and add an adorable Halloween Tutu. Or up your game and create this No-Sew Princess Baby Costume with a little effort. I made this Olaf costume using a hoodie and it works well for toddlers and school-age kids. 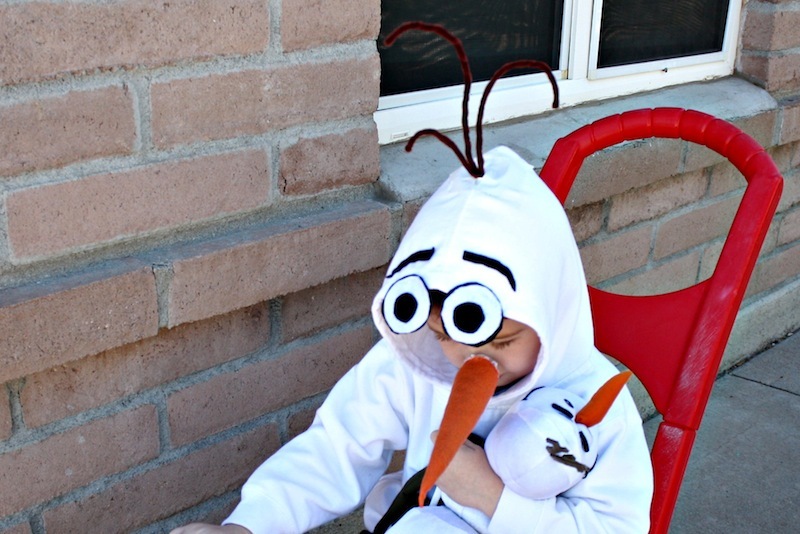 If you want a baby snowman, check out this DIY Olaf Onesie Costume. Pair it with a stuffed Sven and I think you have a pair cuter than Anna and Elsa! I don’t usually think of Cruella as cute but this DIY Cruella de Vil Baby Onesie costume somehow is! Maybe it’s the tutu! In fact, it’d be cute to add a tutu to this DIY Superhero Baby Costume too! FROZEN and superheroes are all the rage but what about emojis? This mama has you covered with a DIY Emoji Baby Costume. Everyone loves a cupcake! How about making a DIY Infant Cupcake Costume, totally sweet but without any calories! You could also buy this cupcake baby costume one ready made! Besides cupcakes, I love a good dole whip. I haven’t found a baby dole whip costume yet but this Handmade Pineapple Baby Costume is pretty close! I don’t love sushi but I still like this silly DIY California Roll Sushi Costume. How cute is this DIY Parrot Costume? It’s actually Skully from Jake & the Neverland Pirates, so if you have an older sibling, don’t miss my DIY Jake costume. It would also go well with a Captain Hook or Mr. Smee costume! If parrots aren’t your thing? How about farm animals? Check out this baby chicken costume and Baby Cow Costume. This Hooded Teddy Bear Vest reminds me of my costume hoodies! It’s super cute and can be worn easily worn year-round! This bunny baby costume would be fun for Halloween or Easter! I feel a Star Wars onesie costume coming next year!